In one of our recent monthly interactive webcasts, we toured the 2019 Travato 59K, 59G and ALL NEW Lithium Travato 59KL. Guests chatted in on Facebook, YouTube and our site with questions about the coaches, and we collected the top ten questions. Read them below. WATCH THE INTERACTIVE WEBCAST ON THE 2019 TRAVATO 59K, 59G AND 59KL HERE. How long will the compressor refrigerator run without shore power? The compressor refrigerator is powered off the zamp solar panels adhered to the roof of the Travato. A while back we completed an experiment when the 59K introduced the compressor refrigerator. WATCH THE SOLAR EXPERIMENT ON THE TRAVATO HERE. We were able to consistently cool the refrigerator for nearly a week without draining the battery. When we completed that experiment, the Travato only had 100-watts of solar standard and now the Travato has 200-watts of expandable solar standard. How much solar can you add to the Winnebago Travato? All of the Travato floorplans come with 200-watts of solar standard. There is room on the junction box to add up to 250-watts either on the roof or through the portable solar plug-in on the side to total 450-watts of solar. What is the recommended temperature for the lithium and what is the recommended way of warming them up? The lowest recommended temperature for lithium is 32° F. The lithium batttery is housed in a steel, heated compartment which heats off the Truma Combi System. So, as long as you are running the Truma Combi system the lithium system should have no issues with temperatures above 32° F.
How has the insulation in the 2019 59G and 59K improved? 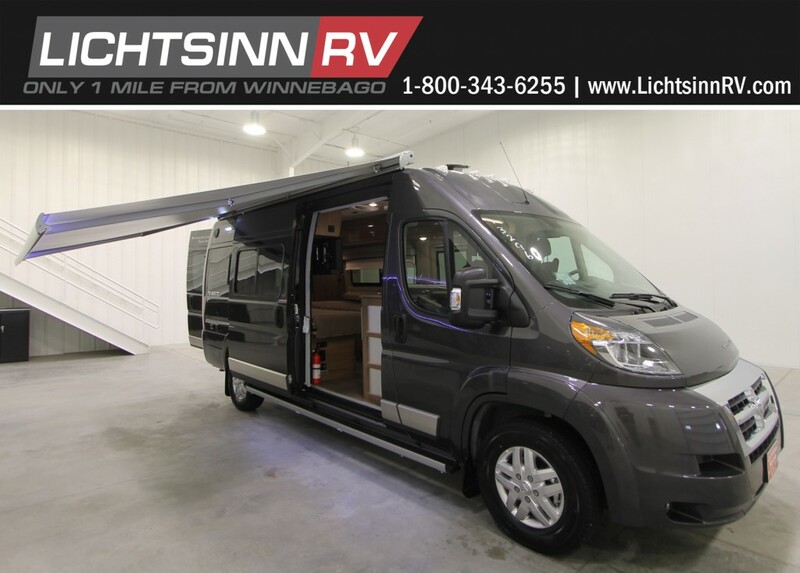 Winnebago has added additional insulation in the sidewalls in the 2019 59G and 59K and has added the cassette blinds to the Travato 59G, 59K, 59GL, and 59KL floorplans which also improve overall insulation. Are their front cushions available to turn the swiveling cab seats in the 59K to a bed? Yes, you can get aftermarket accessories that allow you to turn the swiveling cab seats in the 59K into a bed. Contact the Lichtsinn RV Parts Department for additional assistance with these accessories. What is the ground clearance in the 59G, 59K, 59GL, and 59KL? All four floorplans have a ground clearance of 6.25″. In the Travato 59KL and 59GL, the steel, insulated box that holds the lithium battery pack is positioned underneath axle of the vehicle, so you should not encounter any issues with departure angles. Are the waterlines inside the coach in the 59GL and 59KL like they are in the 59G and 59K? Yes, the waterlines are inside the coach in all four floorplans, making the Travato a true 4-season RV. What are the tank sizes in all four floorplans? What is the availability and pricing on the 2019 Travato 59K, 59G, 59KL, and 59GL?